The first time he heard the puzzle, Lin was stumped. 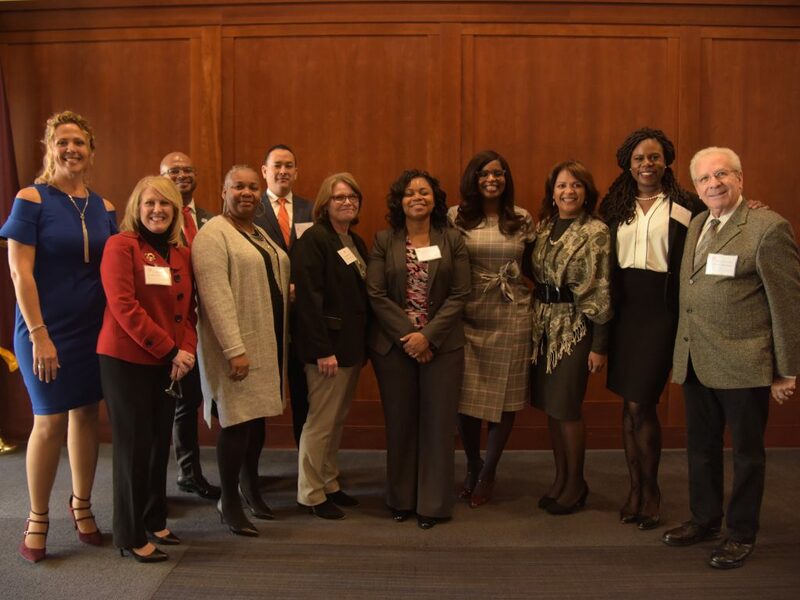 So was his audience—more than 40 educators, statewide leaders, and GSE students, who were gathered at the Graduate School of Education’s thirteenth annual leadership conference. Then there was a gasp. “Oh my God, she’s a woman!” someone blurted out. “That’s one possibility,” Lin acknowledged, as murmurs swept across the audience. “It’s also possible that the kid had two dads. The greater the diversity, the more perspectives are shared, he concluded. And this, ultimately, helps foster a welcoming environment for all students. Lin was one of six guest speakers who spoke about the dynamics of diversity in educational policies, practices, and leadership at the conference organized by four faculty and staff members in the GSE’s Educational Leadership, Administration, and Policy Division—Jacqueline Bocachica González, Ed.D. ; Stanley Kaminsky; Cristiana Ritchie-Carter, Ph.D.; and Shannon R. Waite, Ed.D., committee chair—on Wednesday, Nov. 14, at the Lincoln Center campus. 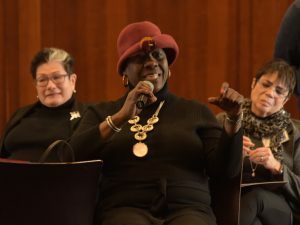 They spoke on a range of diversity-related topics—racism in the education system, LGBTQ youth, gender microaggressions—and shared solutions for the classroom and everyday life. 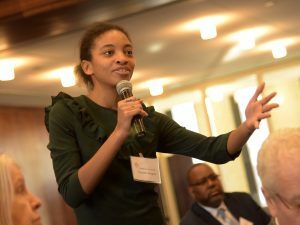 The keynote speaker was Charissa Townsend, the executive director of the Young Men’s Initiative (YMI) in New York City Mayor Bill de Blasio’s office—a cross-agency enterprise that tackles disparities among black and Latino boys and men through educational, employment, and mentoring programs in New York City. “Charissa has an important belief that we share here at Fordham—equal access to opportunities and resources that enable people to live lives of self-worth and hope,” Virginia Roach, Ed.D., dean of the Graduate School of Education, told the audience. For almost an hour, Townsend candidly spoke about the importance of having a diversity of perspectives in places where policies are created and the “messiness” of developing and implementing diverse policies. She also talked about how YMI has spearheaded mentoring programs and policies that include people from diverse, unusual backgrounds—namely, teenagers on probation and formerly incarcerated individuals. “If you saw a lot of them on the street at midnight, walking down the street in central Brooklyn, you might cross the street. Or you might clutch your purse,” she said. But when the process is handled correctly, she said, it can be successful. “We have the evidence to say that programs where you hire people like this—when we include them in the decision-making and the program decision—they work,” she said. Several of YMI’s mentoring programs have helped individuals get back on the right track, Townsend said. One of their programs, a one-on-one mentoring program for 14-to-17-year-old teens on probation, helped reduce reconviction rates in New York City. Over 90 percent of individuals did not get convicted for a crime within a year of entering the program, Townsend said. Townsend had a few diversity tips for the policymakers in the room. She urged the audience to rely on their personal experiences and tools at hand; analyze successful evidence-based outcomes; utilize info from people working on the ground; and, most importantly, remember why they’re doing it all. “Continue to look at the people that you’re serving—the beautiful array of personalities and faces and backgrounds and ethnicities, and everything that they bring,” Townsend said. For a panel on diversity in schools, Lin, who leads J.H.S. 22, Jordan L. Mott, was joined by four other educators—Rahesha Amon-Harrison, GSE ’01, superintendent of district 16; Mahaliel Bethea, GSE ’19, principal of the Eagle Academy for Young Men of Harlem; Deirdre Callahan, Ed.D., GSE ’18, assistant principal of M.S. 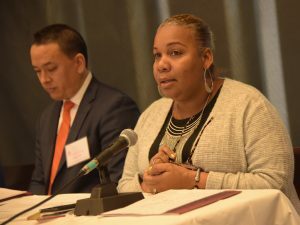 343 in district 7; and Meisha Ross-Porter, GSE ’21, executive superintendent of six districts in the Bronx—reflected on how diversity affects schools. González, a GSE clinical assistant professor, moderated the panel session. All five educators have presided over schools in the Bronx— a fact that doesn’t always attract positive attention, said Ross-Porter. The panelists went on to describe how they incorporate diversity in their leadership approach, their personal encounters with diversity issues, and their vision for the future. But even after educators of color are hired, they still face challenges that shouldn’t be part of their profession, said Amon-Harrison. She spoke about a colleague who criticized her natural hair and asked her if she could straighten her locks. Educators aren’t the only ones who grapple with race, gender, and other diversity issues. 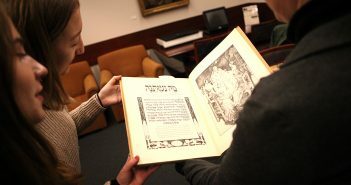 As early as the age of 3, young people develop their own notions of gender and race, Callahan said. Janet Mayers, a 75-year-old retired NYC educator, praised the panelists at the end of the event. “The comfort level, the transparency, and the personal experiences that they have given … I’m sure there are people sitting here who now can leave with no doubt that, ‘Oh my God, I heard something that I’ve been struggling with [too],’” she told the audience. Bethea remembered a mistake he made that affected his students at the Eagle Academy for Young Men of Harlem. During his first years as founding principal, he had hired as many men as possible at the all-boys school. But one day, he learned that some of them were telling the students to “man up.” These are microaggressions with huge ramifications “when you have boys of color who may be the only male in the house,” Bethea explained. The five educators also addressed a diversity issue that affects their transgender students—gender-neutral bathrooms. Ross-Porter recalled a colleague who was uncomfortable with the new policy. “The bathroom problem is an adult problem. It is adults feeling uncomfortable with having to pick a bathroom,” Ross-Porter emphasized. And, she added, it’s a difficult decision for some of their students, too. 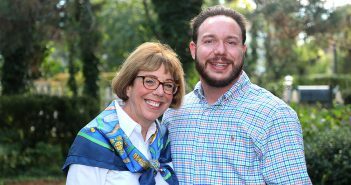 “Imagine being a 14-year-old boy transitioning into a girl, and having to make the decision about where you pee,” Ross-Porter said. “In front of everybody,” Callahan chimed in. Most mornings, you can find Lin at the entrance of his school, greeting students as they walk in. One day, he said, he spotted a student wearing a unicorn headband. He borrowed her headband, and, for the whole day, walked around the building with a shiny horn above his head. His goal, he said, was to normalize the idea of a man wearing a headband. A week later, he presented a unicorn headband to every adult in his school, including security staff, cafeteria workers, and custodians. When he doled out the first batch at a staff meeting, he watched their reactions. Most people eagerly put them on, and snapped photos with their new accessories, he said. A few first surveyed their colleagues, and then slowly placed it on their heads. Then there was the small minority who refused to wear them. “When you start to do things that just start to normalize things,” he said, “then things become normal.” And, he added, that’s a diversity lesson for both inside and outside the classroom. Left to right: Deirdre Callahan, Cristiana Ritchie-Carter, Mahaliel Bethea, Meisha Ross-Porter, Edgar Lin, Virginia Roach, Charissa Townsend, Rahesha Amon-Harrison, Jacqueline Bocachica González, Shannon R. Waite, and Stanley Kaminsky.